Often I've heard people recommend to eat what's grown locally, and in season. Now that's great if you've got a garden, farmer's markets (which we are blessed with many here in Northern California), or a great grocery store or a specialty market, but not everyone is so lucky. Say you're heading to your regular grocery store and wonder, what's in season where I live? 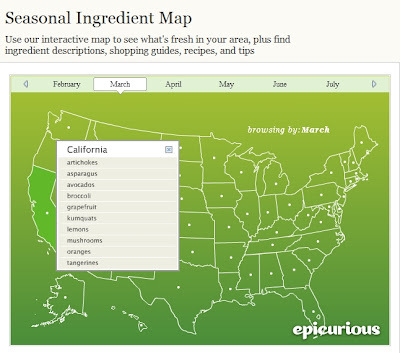 Epicurious has a handy web site to help you find out! In their Farm to Table Guide, you will find a peak-season map of the United States. Choose the month, then choose your state, and a menu will pop up with a list of peak season fruits and vegetables. Need ideas for what to make? Mouseover the produce items, and two links will appear -- click one for a description, and the second for a sampling of recipes using that ingredient. Of course you can now use Google search engine to search for recipes... just type the ingredients you want and the word recipe in the search box -- then limit the results by clicking on RECIPES in the left side.